These numbers reflect estimated student expenses for the 2019-2020 school year. Amounts will change slightly from year to year, but as the cost of college increases, the scholarship packages will correspondingly increase. Your official financial aid award will be included in a letter directly from Colorado College. Outside funding will replace any federal funds awarded, with the exception of the Pell Grant. Outside funding will then be added up to the Cost of Attendance. Students must submit their insurance information during the summer through the Wellness Resource Center to see if their existing coverage applies while at CC. If not, students can notify the Financial Aid Office their coverage wasn't accepted and the grant for insurance will be added. Students must maintain satisfactory academic progress toward a degree as defined in the institution's academic catalog and be in good standing in accordance with College policy to maintain this award. Student awards are renewed each year at the agreement level above (work study and work contribution from summer covering books, travel, and personal while grants will cover the rest of the expenses). Colorado College believes that one of the best investments is a good education, and its pursuit should not be compromised by financial concerns. Many families mistakenly assume they cannot afford a private liberal arts education. However, Colorado College seeks a highly qualified and diverse student body. For this reason, Colorado College offers a strong financial aid program that enables students form all economic backgrounds to enroll. Colorado College strongly urges students to explore the possibility of financial aid as they plan their college education. 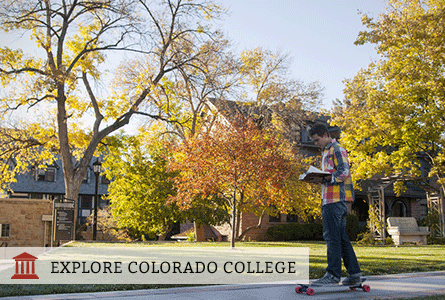 It is Colorado College's goal to make CC affordable to all admitted students who apply for assistance on time. Colorado College grant assistance is based on students' financial eligibility and admission credentials. Use Colorado College's MyinTuition to estimate the financial aid for which you are eligible.